This article is targeted towards people who already have a familiarity with sport betting in general, or already bet the NHL hockey. A lot of my friends have been betting hockey for years via the likes of Pro-Line, Sport Select,Oddset, Mise-O-Jeu and whatever other Government-run betting options are available in your province. However betting online is a LOT better than betting Pro-Line or Sport Select – you’re basically throwing money away when it comes to betting with Sport Select. However a lot of my friends have been hesitant to bet online – not sure how exactly it works, what sportsbooks to trust to bet hockey or how to get started. I’ve thrown together this Beginners NHL Betting Online Guide to help assist you, answer all of your questions and alleviate any fears. If you’re new to sports betting or hockey betting in general, then I recommend reading my Betting NHL for Dummies guide instead. Also here’s the sportsbooks you should have an account at. You should have an account at all of these – the reason is some will have better odds than others. The other reason is they all have deposit bonuses you can increase your bankroll by moving your money around. However if you’re new to betting, start with the top one and then slowly work your way down as you get more comfortable. The main one is odds. Sport Select are notorious for offering horrible betting odds compared to online, or Vegas odds. Vegas odds for example will generally have a juice or vig of 110% – meaning you would bet $110 to win $100. However Sport Select odds are generally at LEAST 130% juice or vig, and in most provinces force players to bet parlays. This means that the juice can go as high as a ridiculous 300%. I mean look – I’ll explain it – but go check out the hockey section at any online sportsbook. You’ll see a much more wide variety of options, plus a lot better odds than you’d find at the local corner store. Betting online you don’t have to bet a parlay – you can bet just one game, for much fairer odds. And if you DO want to bet a parlay? Then you will get MUCH better odds than you would if betting via sport select. Another reason is convenience – no need to keep walking to the store to place a bet or get your money – simply relax on your couch and bet online. At your fingertips is tons of data, NHL Betting Tips etc as well. Then there’s bonuses. Do Sport Select give you free bets? Nope. Do online sportsbooks give you free bets or bonuses? All the time! Do Sport Select reward you for betting with them? No, but online sportsbooks offer reward programs. Hell – you can even bet on your cellphone at the majority of online sportsbooks. Most online sportsbooks offer a mobile version of their website so you can bet with ease. There are a lot more reasons but I just want to cover the last one – trust and security. Most people prefer to bet with Sport Select because they get the money immediately if they win. However most online sportsbooks are able to process withdrawals within 24 hours, and accept bank wires, credit cards etc. You may also wish to sign up with an intermediary like Moneybookers – they act as a bank, a go-between your actual bank or credit card company and the online sportsbooks, and will process all your money for you. There ARE some shady online sportsbooks out there – but at BetNHL.ca I only provide you with the sportsbooks that I personally use and trust. I’ve been betting at every one of these sportsbooks for at least a year and some for as much as 10 years. As long as you stick with the sportsbooks listed on BetNHL.ca, you’ll be fine. The process of depositing at online sportsbooks can turn people off – but it really shouldn’t. It’s incredibly easy. Everyone Else: Bet365 or 888 Sports. Once you registered at your preferred sportsbook and logged in, there’ll be an option to deposit. Most books will just list “Deposit” as a link while others will link to their Cashier. You go there and choose the method to deposit – be it via a bank transfer, credit card, interac e-transfer or whatever – and that’s it – you’re good to go. It couldn’t be any easier. Same deal as depositing – log in, then find the “Withdraw” option. Your options for withdrawing will differ at every sportsbook. However most of them offer both a check – sent via courier so you can get your money within 24 hours – or a bank wire, which also will take about 24-48 hours. There’s a LOT of online sportsbooks to choose from – and a lot depend on what type of sports better you are. We’ve got a full article dedicated to where to bet on the NHL and various reviews. Those are the best ones to choose from depending on your country. They offer a great bonus for new signups, have the best software, very good if not the best odds and cover the most betting options. So go with one of those and you’ll be good to go. Betting hockey online may seem intimidating at first – but it’s actually really simple. Look for “Hockey” or “NHL” which is usually in the sidebar. This will bring up a list of selections, such as NHL Hockey Lines, NHL Play Props etc. Click the option for the bet you want to make, ie: NHL Game Lines. In the main area, all of the betting options for that nights games will appear along with the odds you are getting. Click on the one you want to bet or put a checkmark in if it asks you to do that. On the right side, the “Bet Slip” will now list this. Put the amount you wish to risk – ie: $10 in the box. Cclick “Place Bet” and this will place your bet. That’s it – you just made your first online bet at NHL hockey! If you have any more questions we’re happy to help. 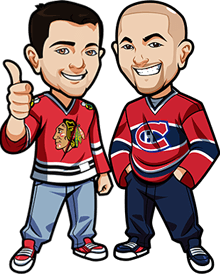 Send me an e-mail with any questions about betting hockey online and I’ll answer you quickly.